Manged & Maintained by a British couple-4 bedroom Villa,all to your self,!!! walled all round, so very private, & quite,5mins walk takes you to local shops,10 mins walk takes you to all beches,shops restaurants. taxi & rickshaws are able to come right to the frontdoor of the house, so suitable for those with walking difficulties ,spacious flat roof, with outstanding views, and a terrace on the ground floor ,with 3 large balconies upstairs. A very large landing with a second kitchen,, also gardens to relax in.1 Bedroom downstairs 3 up,all en-suite with hot & cold water due to sola heating. The benefits of renting this unique house are-- you will NOT be sharing with any one else, all to your self, its spacious, so if there are quite a few of you, you will not be under anyone's feet, you have a front garden & a back, also a drive. There is a downstairs en-suite bedroom for those that might have a problem with mobility .,a large landing, which can be used as an office You are in walking distance of all amenities , beaches ,shops, restaurants ,chemist ,ATM,super market ,etc, We have sola heating for your showers,& in the kitchen We can offer yoga, beauty treatments, Ayurveda massage & treatments, We also arrange for a complementary food basket on arrival. A spacious well equipped kitchen very bright, has a gas hob, micro wave , kettle ,toaster, large fridge ,and freezer, walk in pantry. Their is one of the oldest golf courses in India, located in Trivandrum, approx 40 minutes away by transport. We have no objections to smokers ,as long as its not in the premises . Thank you so much for your great feedback, it was so nice to have met you both,will sort out the sun loungers promise ! You will always be welcome back,it would be so nice to see you again. Wishing you all the best now,& for the "New Year"
Greeted with smiles at the airport and driven the 20 minutes to the Villa by Quinny who ensured that we had everything we needed. The villa is very spacious and spotlessly clean. You are even protected from power cuts by a system which automatically provides power if the supply fails. The bed are comfortable and the Villa has everything you might need but the star is the balcony/sit out which is spacious and enjoys wonderful views over the coconut plantations to the sea. The location is quiet but very close to the beaches and shops. I would happily go there again and again. be more than welcome to return any time, I would look forward to seeing you both again. Lots of beaches to choose from, all with lifeguards, most of then just 2 kl walk away, all sandy with beach beds and umbrella to rent, with an array of restaurants on your doorstep . Trivandrum International airport is just 20 minute taxi ride away, we can arrange a pick up for you, or if arriving by train about 35 minutes away. 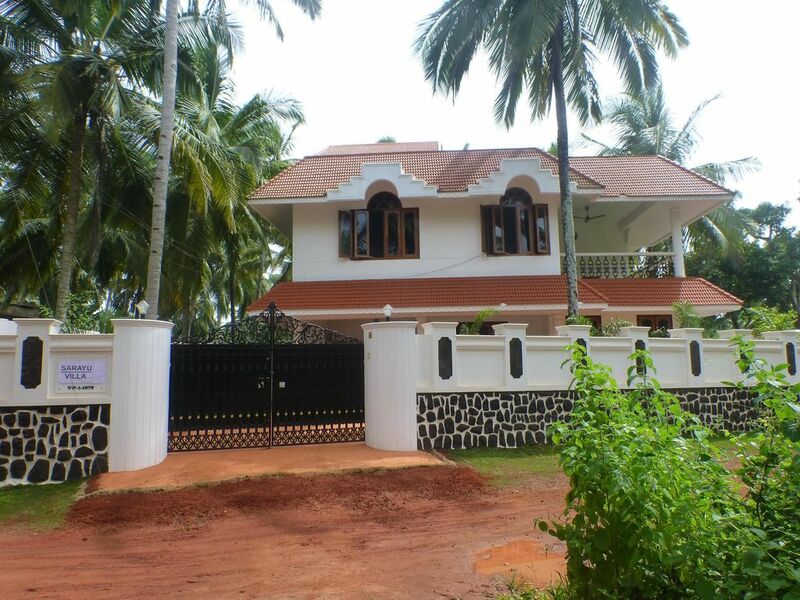 plenty of places of interest close at hand , Temples,Churches Mosques,lots of interesting walks,a lighthouse for you to climb,with fantastic views,lots of restaurants, beaches, fishing harbour, or day trips or tours can be arranged, the main town is Trivandrum,you can shop till you drop, that's about 30 minutes away. All restaurants have a vegetarian choice, or some specialise for vegetarians, there are shoe makers, tailors ,gift shops, boat trips, lighthouse, elephant sanctuary ,beer & wine shop, local Doctor, banks, ATM,supermaket,(which you can buy most essentials) the list is endless. Booking Notes: We can arrange for you to be picked up at the airport or railway Changeover Day: We don't have a change over day, the choice is yours. Notes on prices: We will give discount for long stay, one month or more, also for only 4 people staying or less .